The terrorists are retaliating against the Turkish government for changing its strategy in Syria, a move Ankara has made largely due to Russian pressure, Gregory Copley, editor of Defense and Foreign Affairs publications, told RT. Islamic State (IS, formerly ISIS/ISIL) has claimed responsibility for the deadly New Year’s Eve massacre in Istanbul, where a lone gunman stormed a popular nightclub and opened fire on partygoers, leaving 39 dead and many more injured. Foreign nationals were among the victims. The attacker, reportedly supported by Islamic State, remains at large. — RT (@RT_com) 1 января 2017 г.
RT: Do you believe there is a direct link between the massacre in Istanbul and Turkey’s efforts to bring peace to Syria? Gregory Copley: Well, I don’t believe that Turkey is seriously considering bringing peace to Syria. I think it is trying to extricate itself from a situation which got out of control and which has backfired on Turkey. And that has angered the group which it sponsored, DAESH or Islamic State [ISIS/ISIL, DAESH]. All of the indications point to the fact that this is done by ISIS, because it was a well-organized, well-planned, well-executed attack. Choice of the target was significant and in line with ISIS objectives. I believe we’ve seen that as the Turkish government had been forced to back off of its support from ISIS, and perhaps move to support other jihadist groups, Al-Qaeda-linked groups. In fact, the ISIS people are now out of control. They are taking retaliatory steps against the Turkish government… So, yes, it is certainly a result of the fact that Turkey has had to try to change its methodology in Syria – largely because of Russian pressure, largely because the whole episode has backfired and the civil war has been now carried back into Turkey itself. Especially on New Year’s Eve – the security should have been much better than this. Yet, we see a breach in security and another breach by them not being able to catch the man yet. He has killed 39 people, and injured 17 more. Marwa Osman, political commentator, told RT. RT: Speaking after the tragedy, President Recep Tayyip Erdogan said Turkey will continue to fight against terrorism and its backers “till the end.” Could this incident prompt Turkey to intensify its role in Syria? GC: Certainly. 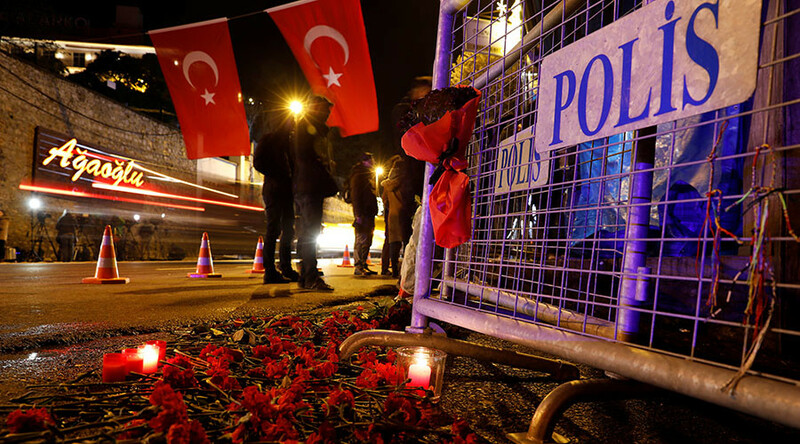 It has to do something to curb the backlash from ISIS into Turkey itself. It can’t really project conventional force very seriously into Syria, or for that matter into Iraq, because its armed forces are not strong enough to do that, which was why they engaged into the sponsorship of proxy forces in the first place, initially through jihadist groups in the Al-Qaeda realm and others, and then supporting the split within Al-Qaeda, which led to the creation of ISIS. These have been literally managed at arms-length through MIT, the Turkish intelligence service, which also, by the way, has been running operations in Libya. And it has got into trouble there because now we see the ISIS/Al-Qaeda dichotomy in Libya. There is a fight for power there. We see MIT sponsoring groups such as Boko Haram in Nigeria. It has also been sponsoring groups through Sudan and in the Horn of Africa. So, the Turks have got their hands full. They can’t use their armed forces because President Erdogan has correctly viewed the armed forces as his great nemesis. So, he’s attempted to break up, if you like, the leadership of the armed forces and put in proxy leaders there too – mainly former gendarmerie generals, and so on. But even the gendarmerie is no longer secure. President Erdogan doesn’t have a lot of security cards to play. MIT is about it.